Damascus : At least 70 people were killed in Douma, the last rebel-held town in Syria's Eastern Ghouta in a suspected chemical attack, medics and rescuers said on Sunday. Volunteer rescue force the White Helmets tweeted graphic images showing several bodies in basements following the attack on Saturday, reports the BBC. It said the death toll was likely to rise. 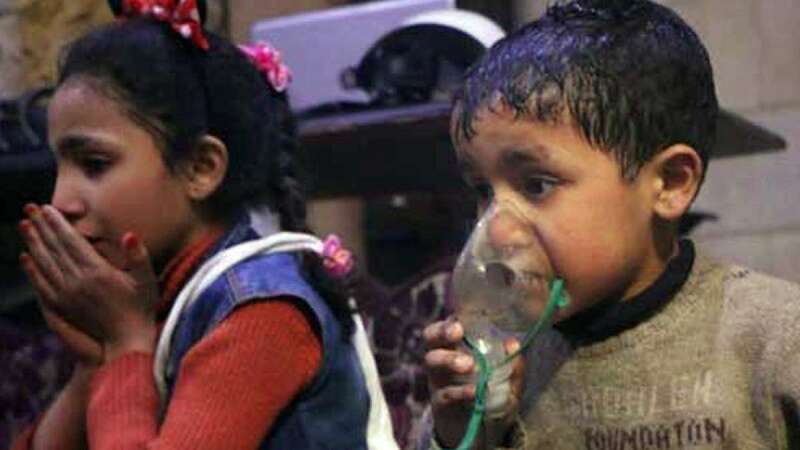 Several medical, monitoring and activist groups reported details of a chemical attack, but figures vary and what happened was still being determined. The pro-opposition Ghouta Media Centre said over 75 people had "suffocated" while a further thousand people had suffered. The Union of Medical Relief Organisations, a US-based charity that works with Syrian hospitals, told the BBC that the Damascus Rural Specialty Hospital had confirmed 70 deaths. She told the BBC that there were reports of people being treated for symptoms including convulsions and foaming of the mouth, consistent with nerve or mixed nerve and chlorine gas exposure. The Syrian government has denied the allegations. State news agency SANA cited an "official source" saying the reports were a "blatant attempt to hinder the army's advance" into the "collapsing terrorist" stronghold, reports CNN. SANA said the Syrian Arab Army "does not need to use any chemical materials as claimed by terrorists' media affiliates". "As we've said, Russia ultimately bears responsibility for the brutal targeting of countless Syrians with chemical weapons. Russia's protection of the (President Bashar al) Assad regime and failure to stop the use of chemical weapons in Syria calls into question its commitment to resolving the overall crisis." The sarin nerve agent has been used in Syria before. In April 2017, more than 80 people were killed in a sarin attack on the rebel-held town of Khan Sheikhoun -- an attack that prompted the US to launch 59 Tomahawk cruise missiles at a Syrian airbase. In August 2013, rockets containing sarin were fired at rebel-held areas of Eastern Ghouta, killing hundreds.